With all the Transformers 4 movie news, I allowed the toy related links to stack up so this is my attempt to clear them out. Also trying out a new format to see if it is easier to read and use. Let me know what you think. 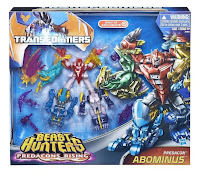 As for what the links cover, we have the usual 3rd party lineup that includes lots of combiners, a look at Beast Hunters Abominus, more Generations toys with more images of IDW wave, Metroplex and possible re-release of Grimlock that never seemed to make it to toy shelves in the states. 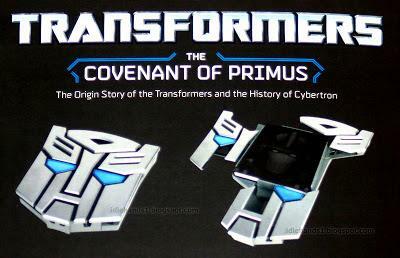 A new and expensive book is coming at the end of the year that might actually explain the 13 Primes was mentioned in Revenge of the Fallen and teased for the comic books before going nowhere. 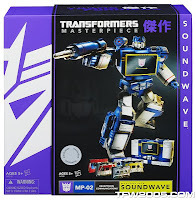 The Masterpiece line continues with a look at the Hasbro Soundwave and upcoming new figures. 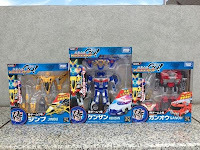 Last week the Tokyo Toy Show was held and it showed off most of the various toys covered in these links including the Super GT line (Alternity repaints), teased the Transformers Go (Takara name for Beast Hunters line) cartoon DVD that focuses on their Samurai combiner team. And last but not least is reviews including not The Fallen, not Sixshot and many Beast Hunters and Generations figures. Update: Added a video review of Generations Titan class Metroplex at the bottom of the post. not Stunticons - Fansprojects' final three not Stunticon figures of not Dead End, not Dragstrip (review below) and prototype of not Motormaster. not Arcee - Azalea is an upcoming figure from Mastermind Creations that is a new take on Arcee that looks pretty darn good. Zinnia is green (not Medic) version. Will have but no release date or price. not Blackarachnia - PE-DX02 Arranea is new creation from Perfect Effect that is inspired by Transformers Prime character with motorcycle and spider alt modes. not Predaking - Yep another combiner, this time from Unique Toys with their version called War Lord with look at another not Predacon, Ironhead (not Tantrum), out now. 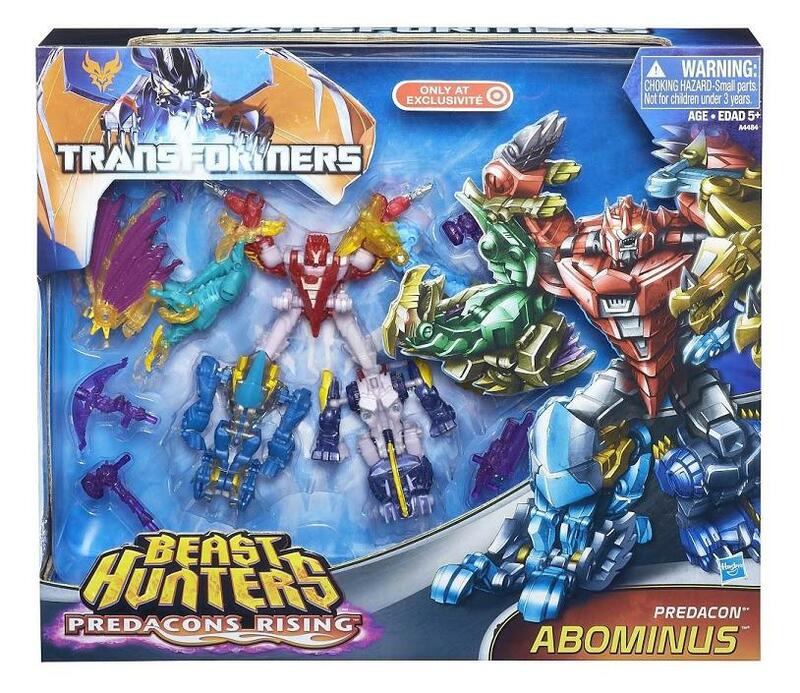 Abominus, In Box, Target Predacons Rising Version - Look at the combiner comprised of five Legends class figures. Target will get an exclusive single package of the set with a modified, shiny paint scheme. No release date. IDW Spotlight Wave - Official images of the IDW comics inspired versions Thundercracker, Hoist, Orion Pax, Bumblebee, Megatron, and Trailcutter. Thundercracker is a repaint of the Fall of Cybertron Starscream mold but the others are new. No release date. Metroplex - Images of the soon to be largest Transformers ever made, out sometime around Christmas for $100. For the sound clips go here. Fall of Cybertron Grimlock - Potential "Platinum Edition" of Voyager Grimlock for US retail with modified paint scheme. Considering the original release never really made it to toy shelves, not sure if this one is coming or not. Ruination - Comprised of five Wreckers (Impactor, Roadbuster, Topspin, Twintwist, and Whirl. Really just a repaint of Fall of Cybertron Bruticus. Generations Ratbat - Repaint of IDW Megatron, this is currently a Japanese exclusive but I would be surprised if Hasbro didn't use it stateside at some point. Hit the link for details with images of a new book that is subtitled "The Origin Story of the Transformers and the History of Cybertron" (or trailer below). The 176 page hardcover is priced at a MSRP of $99 but Amazon has it for $48.82. It comes in a custom case that is shaped like the Autobot shield. The chapters explore that battle between Primus vs Unicron, The 13 Primes, and much more. I assume this is an official Hasbro licensed product so hopefully the areas it explores will join the unified continuity that Hasbro is trying to create that various books, two video games and Transformers Prime is part of. The release date is December 3rd 2013, you can pre-order from Amazon. Hasbro Masterpiece Soundwave - Quick look at the US side release of Masterpiece Soundwave with five cassettes. Toys R Us exclusive, release date is end of summer. The Takara version is also getting a re-release this fall. 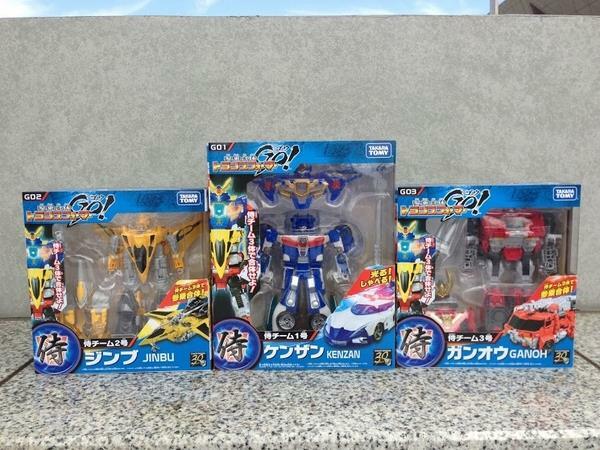 MP-12T Tigertrack - Look at upcoming Japan exclusive release. Its a yellow repaint of Sideswipe. Out in July or August. MP-12G G2 Sideswipe - Exclusive to the 2013 Tokyo Toy Show, is another Sideswipe repaint in Generations 2 colors. MP-17 Prowl and MP-18 Bluestreak - Repaints of each other, look at the robot mode of each. Out around October. $90 each. MP-19 Smokescreen - Another Prowl repaint, expected out in December. Nice gallery that shows off the MP-17 to 19 mold. New Masterpieces - No images but next Masterpiece line additions are MP-20 Wheeljack and MP-21 Bumblebee. No release dates. GT-01 GTR-Prime, GT-02 GTR-Saber - Gallery of images for the just released officially license repaints of a modified Alternity mold from a few years ago. GT-03 is Megatron, which is not out yet. Review of Prime is below. GT-04 GTR-Maximus - Fortress Maximus repaint of the same GTR mold. To me, unless have a "collect em all" approach, I would just get the one like the most but not all four. Super GT Comparison - Hit the link to get a gallery that lets you see what modifications were made to the Alternity mold for the line. The Super GT line does look fantastic and the detailed paint job is one of Takara's best. Just be aware the toy is deluxe sized for a non deluxe price of $120 each. Also despite the small size, the transformation sequence is complicated. 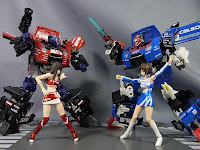 Remote Controlled Transformers - Hit link for video and gallery of Takara's planned RC line that auto transform into robot mode. 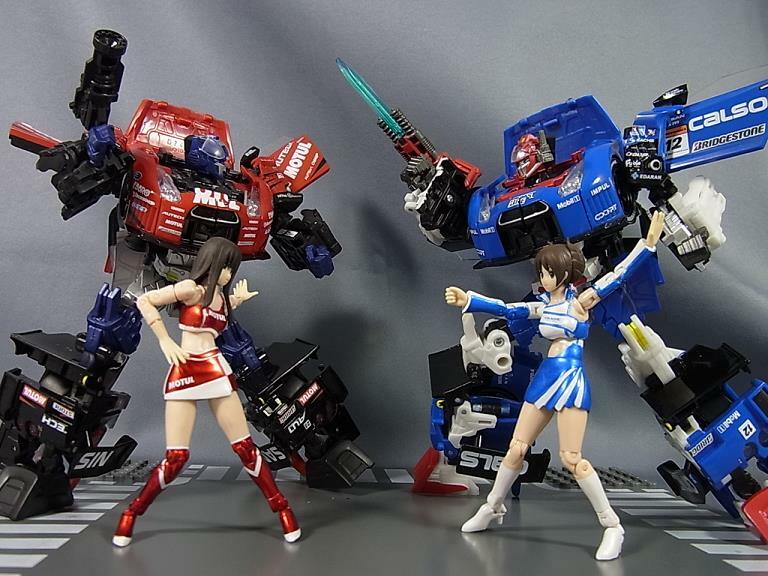 Transformers Go Samurai Team - Gallery of the currently Japan exclusive combiner team that has a "scramble city" approach. By that it means their combination isn't limited to one specific combination. For this one it has three modes, the basic make up being 1 is the head and mid-section, another waist and legs, and the last is the backpack and arms. A video of their lights and sounds is here. 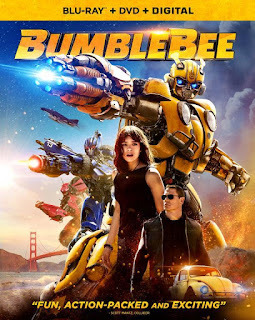 Transformers Go Cartoon Trailer - It seems that Takara is so proud of their TF creation, they have created a direct to DVD story set in Feudal Japan that stars the Samaurai team as they fight against three Predacons. Its unclear if this is Takara take on a season 4 Transformers Prime, an episodic series or a movie. Another trailer is here. Toyko Toy Show 2013 - Hit the link for look at all the toys Takara showed off from Masterpiece, GTR and Transformers Go. The presentation video is below. Pandora's Box Prototype - Review of an early version 3rd party add-on trailer for Fall of Cybertron Ultra Magnus and Optimus Prime. 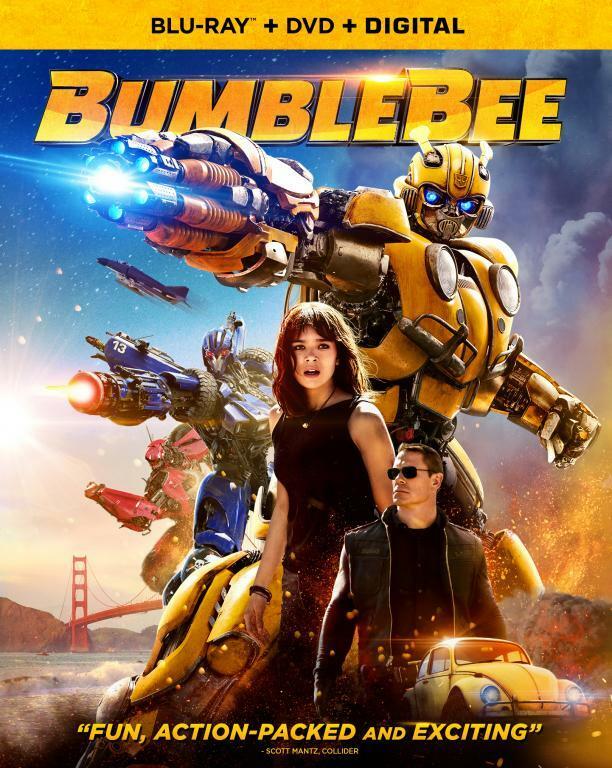 The trailer is comprised of component parts that assemble on the figures to create a bigger and better version of the characters. Out in September for $170 (ouch). 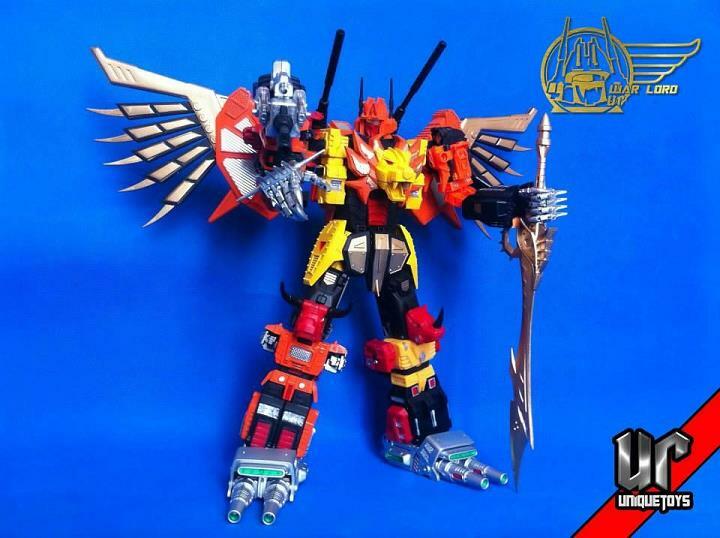 Beast Hunters Ultimate Predaking - Review of the upcoming huge version of Predaking. Not sure when on toy shelves but think the price is $60. Like all of the TF Prime line, it seems bigger remains not better. Beast Hunters Ultimate Optimus Prime - The other ultimate toy. Same bigger not better problem. Transformers Prime Platinum Edition Ultra Magnus - Japanese exclusive, repaint with mold modifcations of the Transformers Prime leader Optimus Prime. Beast Hunters Voyager Ultra Magnus - Poor Magnus, always a repaint of Prime, but with a few mold tweaks to make him clearly Magnus. Beast Hunters Cyberverse Commander Shockwave - Not bad smaller version of Shockwave. Alt mode is meh but robot mode looks good. Beast Hunters Voyager Megatron - Review of the TF Prime repaint with modified mold. A gallery of the figure can be found here. Generations Legends Optimus Prime - Tiny version of Prime with a kind of targetmaster/mini-con of Roller. Interesting take. Generations Legends Bumblebee - Same as Prime only with targetmaster Blazemaster. Generations Legends Megatron - Yep same as two above, the targetmaster figure is Chop Shop. Generations Deluxe Trailcutter - Look at one of the new wave of Generations toys that should be hitting shelves soon. Generations Deluxe Sandstorm - New triple-changer that is a modified version of the Springer mold in yellow and orange. I could get use to these mold modifications which does more to make each character and toy more unique than just the straight of repaint. Down Force - 3rd not Stunticon as created by FansProject, based on Drag Strip. Out now and not bad. A gallery of the figure is here. Terminus Hexatron Limited Edition - Coming soon from Mastermind Creations is Terminus Hexatron which is their version of the six-changer Sixshot (G1 era). This is a limited edition of 120 that acts as a preview of the figure and might inform you if worth ordering the real one when its released. Out soon, cost is around $135. MakeToys Chaos/Paladin - Interesting new 3rd party toy that is two parts. One part is a robot with tank alt mode called Chaos that when merges with Mobine Armor add-on becomes Paladin which is really the IDW's take on The Fallen. The final robot looks truly awesome but not so hot on the alt modes. The toy is out soon for $80. Another version of this is Jungle Type which is the add-on as designed for the Powercore Combiners. That review is here. A gallery of Paladin is here. UT-W02 Ironhead - Review of Unique Toys not Headstrong who is a member of the G1 Predacons. As mentioned above this is the second figure of 5 that combine to for War Lord (aka not Predaking). The review indicates that the line might be a little too faithful re-creation as it has issues. A gallery of the figure can be found here. Out soon, price is around $80. Below is a review of the new official largest Transformer ever made. I have to admit I am very underwhelmed about the figure. The average Legends class figure has a transformation sequence more complex then this toy. Most G1 figures did too. Between the tiny waste, simplistic transformation and the box sized sticker sheet, I am going to have to really think about whether its worth the $100 to $125 price tag when it finally hits retail stores (assuming it does as Hasbro has been having massive problems getting new TFs to store shelves for a while now). Is Michael Bay adding a Pagani Huayra to TF4?